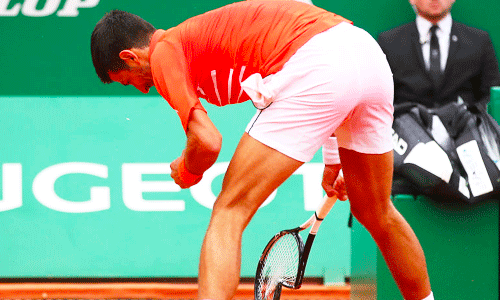 Novak Djokovic had a far from impressive day in the office on Tuesday. And the frustration was evident on his face as he struggled big time to prevail 6-3 4-6 6-4 over Philipp Kohlschreiber of Germany in the second round of the Monte Carlo Masters. After being broken in one of his service games, Djokovic vent his anger on his racket as he smashed it on to the clay courts thrice. The top seed then flung the broken piece into the crowd, inviting boos from a packed crowd. “When he does break it, he breaks it with venom and power,” one commentator was quoted as saying by The Sun. Luckily for the 15-time Grand Slam champion though, the chair umpire didn’t impose a point penalty on him. Despite ending up on the winning side, Djokovic looked scratchy all through the battle that lasted two hours and 36 minutes. Committing as many as eight double faults, the Serbian could only manage to win 62 per cent of the points on his first serve besides being broken on four occasions. He will face either Taylor Fritz of United States or Diego Schwartzman of Argentina in the third round.